Whenever corrections are made to a dosing entry, they can be hidden from view within the Dosing Form. All such entries, whether hidden or not, can be viewed by Date and summarised in a report. The Corrections Entries Report is accessed from the Report menu with a search form used to filter by search criteria. 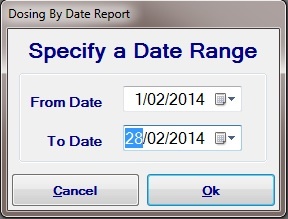 The records are searched by selecting date criteria. All patients, where a correction to dosing occurred, will be displayed.